Edit: ShowMeCables.com has started making this adapter commercially available. This came about as a result of a conversation between them and me. The minimalist design of the iPhone headset appeals to me, and I wanted to try using it for VoIP applications on my PC. The iPhone uses a 4-connector 3.5mm headphone jack, but my laptop has two separate female jacks: one for the microphone and one for the headphones. So, I ordered a connector and busted out my soldering iron. The finished product is below—click through to see the pinout diagrams for reference. 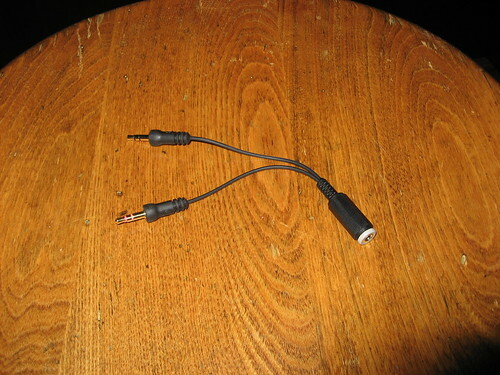 I cannibalized the male connectors from a previous headset (which was clunky and bulky, by comparison to the iPhone headset) and exercised quite a bit of trial-and-error to get it right (tested by holding the wires, soldered, realized my mistake, unsoldered, retested, soldered, tested). The jack in the pictures was purchased online, part 30-705. Does this device work on a macbook laptop? Probably, but I only have a PC so have no way to test.